Remember the Quasar inflatable furniture range? 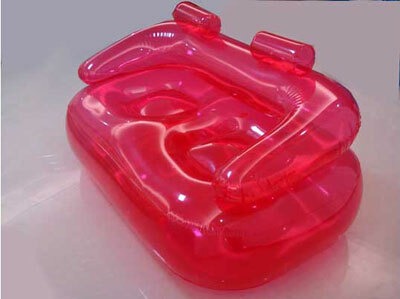 it was the original 60s inflatable furniture, designed by Quasar Khanh and recently reissued by Branex. For authenticity, it can’t be beat, but for price…well, it could be a little cheaper. Around the price of the Homebase 60s-style inflatable seating ideally. Yes, this is a high street take on the 60s classic, offering a choice of armchair or two-seater sofa in blue or pink, both complete with a puncture repair kit, because accidents will happen. And it’s very cheap. The armchair sells for £14.69, while the sofa is yours for £19.59.